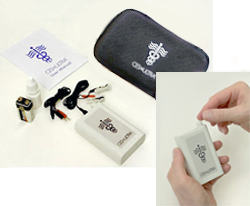 Non-drug Stress Relief and Insomnia, Anxiety and Depression remedies - CES Ultra, Cranial electrotherapy brain stimulation device. Free yourself from the debilitating effects of depression, anxiety, and insomnia - without drugs - using the CES Ultra. 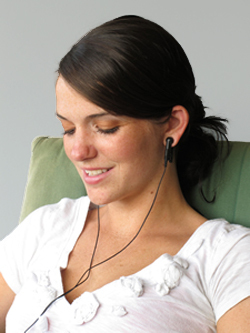 The first thing you'll notice about using the CES Ultra is a pleasant tingling sensation and the feeling of gradual relaxation that comes with Cranial Electrotherapy Stimulation (CES). Within the first two to three days, you'll enjoy better sleep patterns, falling asleep quicker at night with fewer waking periods, and awakening in the morning feeling rested. You'll also notice an elevation in your mood and being prone to less nervous energy and frenetic behavior, if those symptoms have been present. By the end of the first week, you can expect a pleasant, detached state and quieting of the mind with better impulse control and a greater sense of balance, centeredness, and calm. You'll also experience fewer episodes of irrational anger, irritability, depression, and mood swings. By weeks two and three, mental confusion will diminish. You'll notice heightened clarity, alertness, and ability to focus. Your ability to concentrate on tasks will improve, you'll learn at an accelerated rate, and you'll be back to your normal state of information recall.